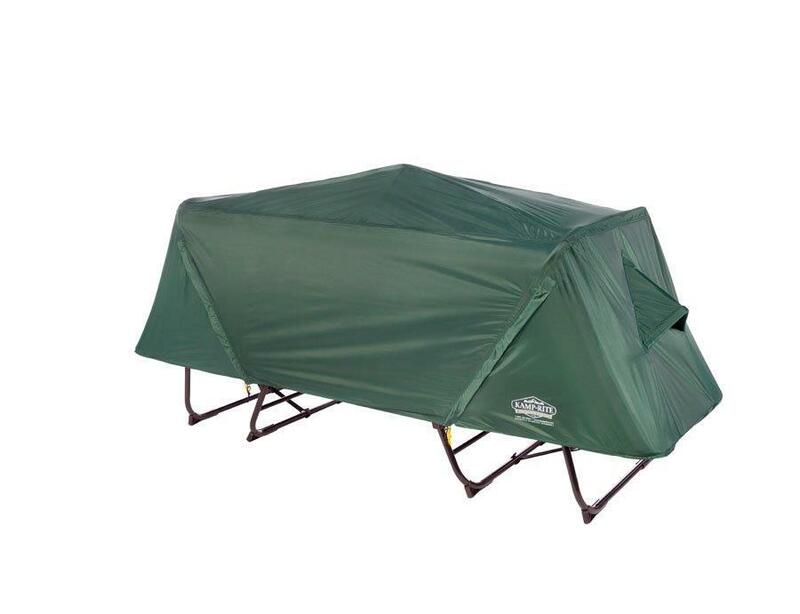 The Kamp-Rite® Oversize Tent Cot stands 11” above the ground and brings additional comfort with its expanded 32” W x 90” L sleeping area. The Kamp-Rite® Oversize Tent Cot stands 11” above the ground and brings additional comfort with its expanded sleeping area. The Oversize Tent Cot is wider and longer than the Original Tent Cot and adds a domed top to create more head room and interior space. 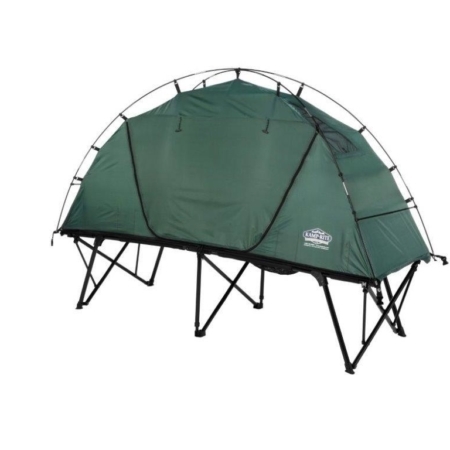 This off-the-ground sleep shelter ensures superior protection from the elements and delivers a level of comfort and convenience not usually found in traditional, old style camping gear. 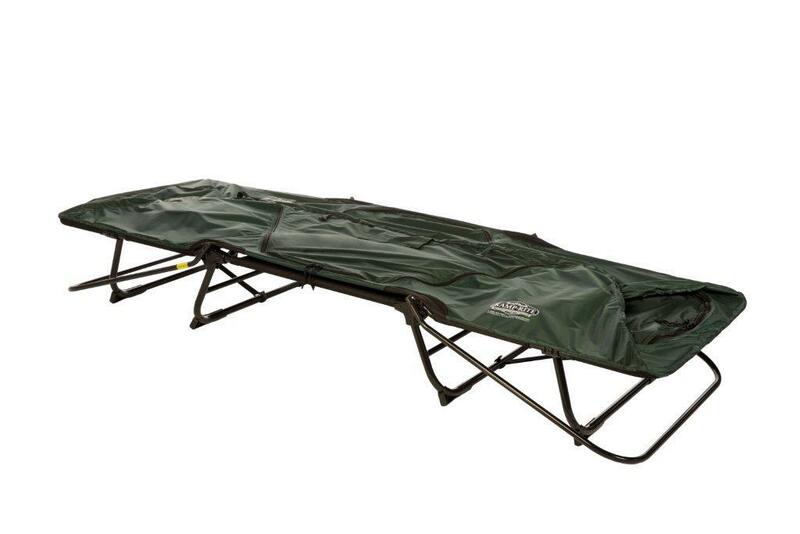 The sturdy cot base includes two additional support legs located at each end of the Tent Cot for extra stability. Extremely versatile, the unique hinge design enables the Oversize Tent Cot to be converted to a lounge chair for daytime relaxation or a standard style cot for sleeping under the stars. 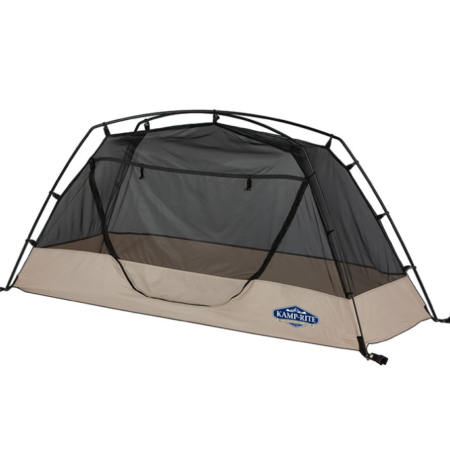 The Oversize Tent Cot sets up in mere minutes and comes complete with a waterproof Kamp-Rite® Rain Fly and a convenient Carry Bag. Kamp-Rite® Gear Storage Bag (clips under the tent cot to provide additional storage). Just received my tent cot as pictured here. I am a matured aged femme who travels and camps by myself. Everything I take with me has to be operated and handled by one person (me)with limited upper body strength. I am able to carry this item and place it in and take it out of the car. Yet to try and put it in the roof rack carrier as I have to raise it over my head and have a crook shoulder. I had watched one video (not many out there), had a look at the info sheet that came with it and was able to put it up in around 3-4 minutes. Same for folding it up. Love it. Better than a swag for me. 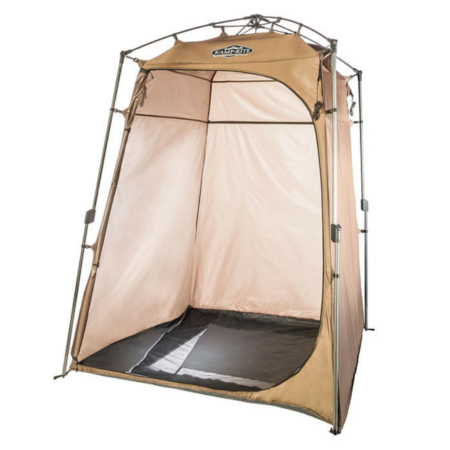 Plus there is plenty of room inside and not claustrophobic with all four sides being able to be opened up with good insect mesh to keep midgies out. The dome rods seem a bit flimsy and a bit short although they do hold the dome up. The inside pockets seem to be back the front? Will need to put in another mattress as the one provided is insufficient for real comfort, too thin, too hard but will help against rising damp. Folded down it is pretty big and takes up the rear of the fourby hence a desire to put it on the roof when travelling. I would like eyelets in the window coverings so I could use them as an awning. Will see what I can do myself about this. Overall despite perceived shortcomings I love the product. Comfortable but wet. I took this tent camping in the Appalachian mountains and had the rain fly attached properly, but after about 3 hours of rain, water started leaking in. By morning I was soaked. Also it isnt portable at all. The thing is gigantic and heavy even when folded up and put in the bag. Not meant for travel. Other than that I love how comfortable the tent is and how easy it is to set up. Great one man test. easy to set-up and take down. with the kamp rite pad it makes the most comfortable spot to sleep. light rain one night without the rain fly and I kept dry. with the rainfly I think i could take on any storm. packs up a little big but, nice storage bag. Still summer here but in the winter I think all tucked up with the rainfly is should stay nice and warm inside. Best little single test ever. Off the ground. Easy to put up and take down. best sleep ever with there self inflate mat. Best little single tent ever. Off the ground. Easy to put up and take down. best sleep ever with there self inflate mat. I bought my “Oversized Tent-Cot” at Bass Pro Shops in Kansas City, Ks 2 months ago. I have used it 4 times so far, and will be using it at least once a month for the foreseeable future. It has a permanent place in my 2 door 2013 Jeep Wrangler. 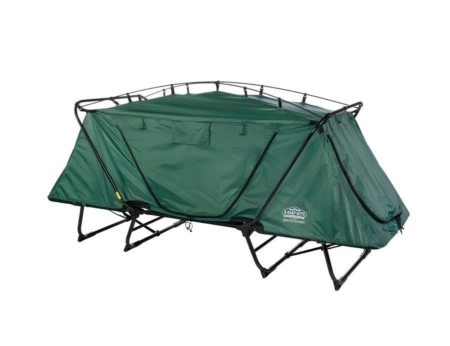 I was looking at buying a 1 or 2 person dome tent, but saw that the 4 Wheel & Offroad Magazine staff really like their tent cots, so I thought I’d give it a try. I’ve been very satisfied so far. 1. Easy to set up – I always set it up after dark and have no problems doing so. 2.Very sturdy frame inspires confidence – 350 lb rating. 3. All four bug screens zip open for excellent ventilation and access. I don’t think (correct me if I’m wrong) that the “collapsible” model opens up this way. 4. “Oversized” model provides more than adequate room, and the domed roof allows me to sit-up straight. I’m 6′ and 170 lbs and sleep/change clothes/relax in it and I would not choose the smaller size unless the “oversized” model won’t fit in your vehicle. 5. Cot design allows great flexibility in campsite selection. You don’t have to concern yourself very much with how smooth/dry the ground is. It’s heavy enough that you don’t need to stake it down except in high winds, yet it’s light enough to drag or carry when the shade moves. 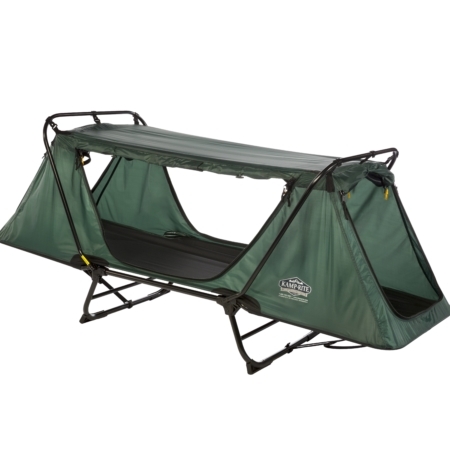 1: Bulky/heavy – best suited for car camping/overlanding, and awkward to carry long distances. 2. Foam pad migrates around from folding/unfolding and is on the thin side. I have removed the factory foam pad and unroll a standard sleeping pad inside after I set it up, but will try to develop a more permanent solution. EDIT: I’ve found that a Therm-a-rest Mondo King XL self-inflating mattress works great. It’s 30″ wide X 80″ long X 4″ thick. 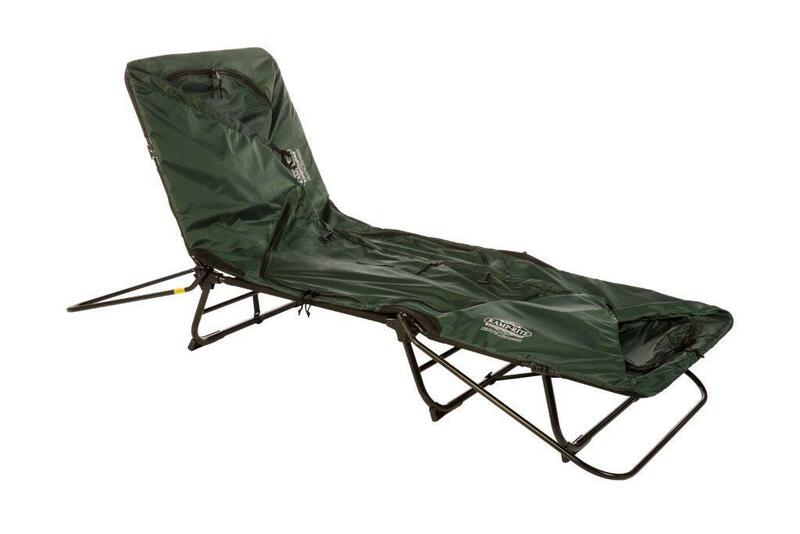 It fills the full width of the oversized Tent-Cot, and leaves enough space at each end for a pair of boots and drink bottles. 3. I have found 2 relatively minor flaws in the stitching. I don’t think they’ll ever cause a durability problem, but I’d prefer if the quality control was a little tighter. 4. I’ll probably never utilize it in the “lounge chair” mode, so it is slightly over-designed in that regard. 5. 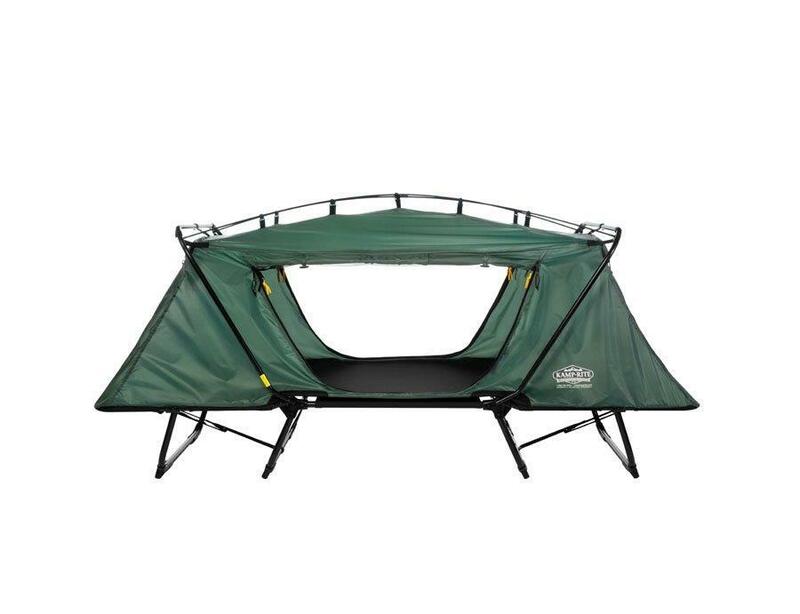 There is a hanging pocket at each end, but I’d prefer it if the openings on the pockets faced the inside of the tent.